“Every Pregnancy is Different.”- This cliche is certainly an understatement! You see I am pregnant with baby #4 and this cliche is so very true. My last pregnancy was in 2008 and prior pregnancies in 2000 and 1997 respectively. To the medical establishment I am considered “Advanced Maternal Age” as I am 43 years old. With my prior pregnancies I hardly had the morning sickness, fatigue, or aches and pains. The common denominator has always been an excessive amount of weight gain! With this pregnancy I had every possible first trimester symptom. The excessive fatigue was honestly debilitating. I felt like a lazy teenager strapped to the couch eating junk food and watching hours of tv (except I hardly watched tv and mostly slept). The fatigue was so bad that just walking downstairs was difficult. Topped with “sickness” (of the bathroom visit variety) and severe nausea. The nausea reached its peak right around 10 weeks and one morning I posted on Facebook about how tired I was of the nausea and headache. Well posting that status was a life-line because a friend stopped by the house with some NoMo Nausea Bands and Anna Naturals Keep It Down Herbal Tea. I cordially accepted the bands and tea as I was desperate for relief. I came downstairs to greet my friend, ‘bed-head’ and all… with non-traditional pjs (mismatched shirt and striped cotton pants that I used during my last pregnancy, almost 10 years ago). What a sight I was! My remedy for “trying” to cure the nausea was drinking gingerale and eating more food. The only thing I succeeded in doing was again…gaining weight! UGH! I went upstairs, visited the bathroom AGAIN, and then decided to open the package of bands. The first thing I noticed was the scent of peppermint. YUM! I immediately put the band on and wondered “What is this round, bulbous part on the inside of the band?” I thought at this point I better take to the package and figure out what it was. Once looking at the packaging I went to NoMo Nausea website and found out how to properly position the band. 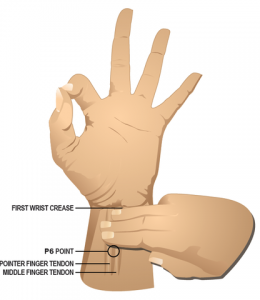 Without going into a long narrative you basically take your right hand with the three middle fingers and place them on the first wrist crease. (see picture right for details) Place the band at P6 (the Chinese Meridian Point used to alleviate nausea and vomiting). Within one hour of wearing the band I was amazed my nausea was almost GONE!! Seriously! I am an outspoken person (my friends tell me this, lol) and would not say something if I didn’t mean it. Within 3 hours my headache was almost gone, nausea completely gone. 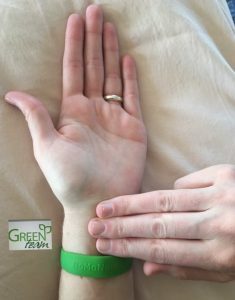 The peppermint oil scent lasts for about 3 days but you can still wear the band long after that. Each package contains 2 bands. The best thing….from that day on I never got sick (in the bathroom) again. WHAT A RELIEF! 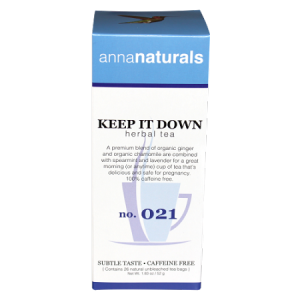 In conjunction with the NoMo Nausea Band I would occasionally have a cup of Anna Naturals Keep It Down Herbal Tea. This tea is made from organic ginger root, organic spearmint, organic nettle leaf, and other organic herbal and fruit extracts. Even though I am now in my second trimester and past the morning sickness/nausea stage I am still enjoying the tea. 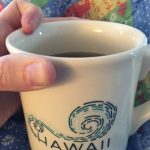 Quite honestly I am drinking a cup in the afternoon, usually in my ‘Hawaii’ mug (I can close my eyes and drink my hot tea and wisk myself away to some place tropical right?) when I get excessive food cravings (are you surprised?) and the tea actually takes my cravings away. Thank goodness because at my last ob/gyn appointment my doctor said I have already gained all the weight I should have for 20 weeks! (and I was only 14 weeks at the time). This entry was posted in Blog and tagged advanced maternal age, anna naturals keep it down tea, fatigue, first trimester, ginger root, morning sickness, nausea, nomo nausea band, pregnancy symptoms, product reviews. Bookmark the permalink.